Reproduction of the Broom Handle Mauser Pistol with Wood Laquered Grip from 1896. 11 1/2" long. Also known under a variety of other names, including C96, M96, Bolo, P-7.63, Broomhandle, Mauser Military Pistol, Large Mauser pistol, Pistole 7.63mm and the Model 1930. 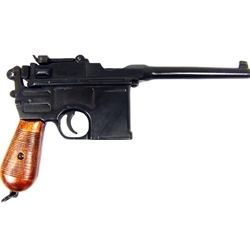 The C96 was the first reliable and efficient design for a self-loading pistol. One of the more notable features of the design was the absence of pins or screws in its construction. This design is based upon the frame being milled out from a solid forging.